Valerian Extract (Bottle) 50tab buy for 1.9900 in store RussianTable with delivery. Valerian is well known for its sedative qualities and its ability to relax the central nervous system and the smooth muscle groups. It has been used as a sleeping aid for hundreds of years especially when there is excitation or difficulty in falling to sleep due to nervousness. Over 120 chemical components are found in valerian and although a very complex herb, it has not been found to have any negative side effects with moderate use. At least two double-blind studies have demonstrated that valerian extract can significantly reduce the amount of time it takes people to fall asleep without changing the normal stages of sleep. 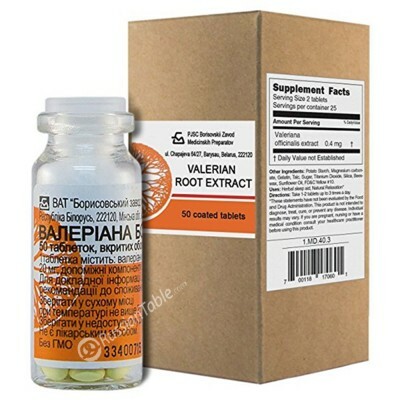 Do you have any questions about Valerian Extract (Bottle) 50tab?